This exhibition in Hong Kong takes the concept of alchemy as a starting point in order to investigate the two-way dialogue latent within the space of an object or idea undergoing transformation. The works of Luke CHING, CHU Chun Teng, KWAN Sheung Chi, Elise LAI, Sarah LAI, LAU Hok Shing, LEUNG Mei Ping, LO Chi Kit, NG Ka Chun are all presented. Typically, the alchemist is involved in the process of turning cheap metal into precious and highly valuable gold; through the process of alchemy, energies of a certain nature are emitted. The artists participating in this exhibition have taken common subjects such as money, silver, and the moon, and then put them through a process of refinement or alteration — the substitution a transformation of an object results in a shift in it’s significant meaning, while also restoring it to its original state as pure matter. The moon is essentially a grey, inanimate object. It projects a silvery light in the night sky, a light which does not belong to itself; this phenomenon is actually the result of the moon reflecting the light coming off from the sun. This characteristic of something not undergoing any essential change except in appearance is an occurrence one can find in alchemy. A captivating and compelling radiance on the outside serves to mask the banality underneath. Contemporary society is likewise undergoing a change whose trajectory runs parallel to the process of alchemy: the democratization of luxury items gradually strips them of their aura of preciousness; at the same time, certain objects of a common nature are symbolically packaged and thus become elevated to a state of prestige. Artists similarly play with signs as they relate to language and symbolic meaning, altering the relationship between the signifier and what is signified; they can turn a stone into a chunk of gold, or vice versa. This process inevitably highlights the tension underlying all things as they are seen in the world. 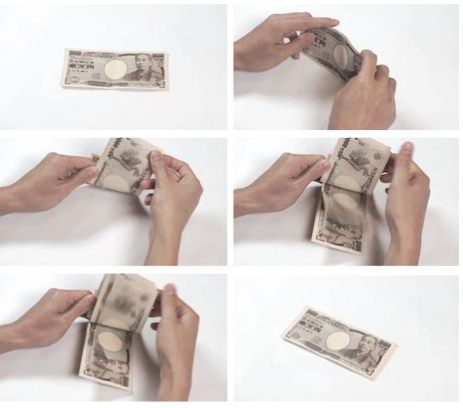 KWAN Sheung Chi’s work, 1000, involves the use of an eraser to rub out the printed surface on a banknote that gives it status as currency, a gesture which obliterates the economic signifier of money and ultimately reveals it for what it is: a piece of paper. However, due to his choice of using a weak eraser for the action, which is intended to reveal the capitalist connotations of a banknote and the characters printed on its surface, the result becomes something altogether more ambiguous. Similar spirit is shown in LO Chi Kit’s work. During his time spent in the Korean town of ‘Ilguang’ (a name which shares a meaning with the word ‘daylight’), LO created replicas of the handmade road signs which the locals crafted themselves, and proceeded to replace the actual signs with the ones he made in their original spots, directing travelers along the road at night to a destination named ‘Wallmyeong (moonlight) Temple’.